George Graham Reviews Taj Mahal and Keb Mo's "TajMo"
It seems as if we are in the midst of a kind of blues and soul revival with quite a few worthwhile recordings by both up-and-coming artists and long-time veterans. This week we have one by the latter, two artists who have been performing blues-related music for decades now, and both of whom have helped to popularize the genre through mixtures with other styles. They are Taj Mahal and Keb’ Mo’, who have just made their first album together called TajMo. Taj Mahal, born Henry Saint Clair Fredericks, has been reaching popular audiences since the 1960s. Originally heading toward a career in agriculture, Taj Mahal came from a musical family and ultimately chose music over the farming career he studied for in college and vocational school. In the early 1960s, while attending the University of Massachusetts, he began performing under the name Taj Mahal, saying it came to him in a dream about India, Mahatma Ghandi, and social tolerance. He has been performing mostly as a solo act, but also in different bands since then. Keb’ Mo’, the nickname of Kevin R. Moore, has a career that goes back to the 1970s. He is also from a musical family who instilled in him his appreciation for the blues. He was something of a prodigy on guitar, attracting wide attention while still in his teens. At age 21, he appeared on the first of a series of albums by violinist Papa John Creach, known for his work with the Jefferson Airplane and Hot Tuna. He has been an active songwriter, and one of the songs he wrote with Creach became part of the Jefferson Airplane’s hit Red Octopus album. His first solo album was released in 1980 under the name Kevin Moore. He began to win wider recognition from his next album, Keb’ Mo’, released in 1994, and which won a W.C. Handy award for best acoustic blues album. Since then, he has been releasing a steady stream of reordings including Keep It Simple which won a Grammy Award for best contemporary blues album in 2005. Both Taj Mahal and Keb’ Mo’ have won audiences outside normal blues channels, with Taj Mahal’s 1969 album Giant Step/De Old Folks at Home finding popularity on the psychedelic scene, and Keb’ Mo’s more melodic approach to the blues winning audiences, and landing him appearances on television and films. Their paths have crossed a number of times over the years, and it would seem only natural that they work together, though each maintains a busy solo schedule. But they did decide to collaborate and, juggling their schedules, they worked for about two and a half years on and off in Keb Mo’s home studio. They invited some guests to work on this project, which features compositions by each, with the duo taking turns on the lead vocals. There is also a mix of traditional material and older blue songs and a couple of unlikely picks with songs by the Who and John Mayer. The instrumentation ranges from an acoustic duo with Taj Mahal and Keb’ Mo’ both on guitars, to a number of more produced tracks with a horn section and a fairly large bunch of background singers. The guests include Bonnie Raitt and guitarist Joe Walsh. 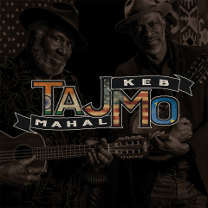 TajMo, the new joint album by Taj Mahal and Keb’ Mo’ is an excellent pairing of two veteran performers who have brought the blues to wider audiences. In keeping with that philosophy, the album ranges from traditional to contemporary, from acoustic to big productions with a horn section and background vocalists. But it’s all quite tasteful, and both gentlemen bring their respective charisma to the project. Our grade for sound quality is close to an A. Both vocals and instrumentation are recorded cleanly and with a warm, natural sound, instead of the distorted, downright bad audio that seems to be trendy among younger retro-style performers. As usual, the dynamic range could have been better. Cranking up the loudness artificially by compressing the sound only degrades the listening experience. It’s great to hear Taj Mahal and Keb’ Mo’ together on their new joint album. Their enjoyment in working together is apparent throughout. The one question that arises is: what took them so long?